Aceteminophen (also known as Paracetamol in Europe) is the pain reliever found in common over-the-counter medications like Tylenol. Oxycodone hydrochloride is a much stronger pain reliever. The presence of this ingredient makes Percocet a Schedule II controlled substance, and is therefore strictly controlled by government regulations. Percocet tablets come in six different doses. Percocet 2.5/325 mg and 5/325 mg should be taken no more than 12 times a day. Tablets of 7.5/325 mg and 7.5/500 mg can be taken up to 8 times per day. The maximum dosage for Percocet 10/325 mg and 10/650 mg is 6 tablets per day. Patients should always follow their doctor’s prescription exactly and never increase or decrease dosages on their own. Percocet is a pain reliever that may be used for short-term or long-term pain relief. It is most commonly used for pain associated with injury or surgery. However, Percocet is sometimes used to control issues related to chronic pain management such as migraines. Due to the oxycodone content in Percocet, this drug is sometimes abused illegally. Off-label uses, meaning situations where doctors may prescribe medication for uses not approved by the FDA, include: for the treatment of insomnia, diarrhea, and for chronic coughing. As there is an addictive component to drugs that fall in the opioid class, off-label prescriptions are used rarely and only in the most serious cases. Percocet comes in a tablet form that is ingested. Once ingested, the medication works by binding to the opioid receptors in the central nervous system and brain. The drug works to slowly dull or block the neural signals that are associated with pain. Once blocked, the patient will feel sensations of pleasure and numbness, along with a general sensation of floating. 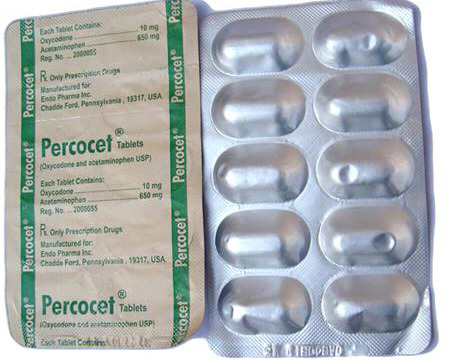 Percocet does not completely block pain, but instead increases tolerance to pain, thereby reducing the discomfort associated with the injury or ailment. This drug should be taken as prescribed by your physician. To avoid constipation during treatment, it is important to ensure 6-8 glasses of water are consumed daily. This medication should be stored in a cool, dry place, and should be out of reach of children and animals. The FDA recommends that any unused dosage should be flushed down the toilet. It is also recommended that anyone being treated with Percocet should ensure they know how many pills they have and keep track of them as it is a drug that is frequently abused. If taken as directed by your physician, Percocet is a drug that is very effective at managing pain. Should feelings of extreme euphoria develop, or should there be any problems with functioning on a normal basis, patients should consult with their doctors to determine if the treatment should be continued or if alternative measures should be considered.